When I first started writing novels…I had no idea what it would take to write novels. That writers put every ounce of their beings into their craft — their time, emotions, memories, old buried monsters, joys, and pain. Who knew that dreaming up worlds required such a tremendous effort and sacrifice? Or that after years of doing what I loved — frolicking about in the vast oasis of my mind — my most beloved activity would sometimes feel less like an escape, and more like (drumroll please): A job. Not this girl. I was just there for the coffee and pretty words, baby. So, what can we do when sliding into the hot bath of our imaginations becomes a chore? How do we get back to that organic magic and joy we once felt about writing? How do we stay motivated to write, to keep working toward our big author dreams, when our day jobs, family stuff, money issues, mental and physical health concerns, deadlines, and the cruel realities of life, begin sucking our creative wells dry? I’m not going to lie, it takes dedication, will, and lots of practice. But after six years of writing while raising five kids, herding animals, working day jobs, navigating kids’ health concerns, poverty, debilitating anxiety, becoming a writer-shaped puddle on the floor, drowning in a sea of sad tears and spending countless days wondering how I’d ever go on, I’ve learned a few tricks, which I’d love to share with you now. 1. Believe you are worthy of your dreams. I love this quote by Rumi: Live life as if everything is rigged in your favor. It took me years to understand the magic of those words, and to learn how to apply that magic to my writing. Especially if you have yet to be agented or published, or if you’re of the anxious variety like me with serious impostor syndrome: you must truly believe that this business has only been waiting for you to arrive. Believe there’s a place set with your name at the authors’ table. Believe there’s a reason the desire to write is so strongly rooted inside of you. Believe there’s a reason you can’t let the stories go. You must know, without a doubt, that there’s a reason your blood runs with words and your mind is a book constantly reading itself to you. You must give yourself permission to dream big, and believe with your entirety, you will reach your goals. Believe this, and I swear, if you work hard for those dreams, one day, your dreams will work hard for you. 2. Remember why you write. Do you have a story to purge from your soul, something weighing you down you need to set free? Do you have a personal experience you want to share with others going through the same thing, so they know they’re not alone? Do you want to make people laugh or fall in love or give a bit of respite and peace to readers, so they can escape from this real-life scary world? Because my childhood was filled with real-life dangers, nightmares, and fear, I write for the kids going through the same sort of battles, kids who feel alone. When I struggle to write, I force myself to remember why I am here. That there are kids (and adults) out there who want to see the innocent stand up against their monsters. There are readers who need a book-friend, as I did when I was little and afraid, going through things I couldn’t tell anyone about, things I couldn’t even comprehend. Try to remember that there are readers out there right now waiting for your voice, your experience, your heart smeared on the page, who need a book that understands. Remembering who I’m writing for (even if it is myself) always gets me back to work. It may seem counterproductive for a post on Creating Motivation to advocate for rest. But, as someone who grapples with an anxious and slippery mind, after chasing motivation around the hamster-wheel of WHAT-AM-I-EVEN-DOING-I-AM-THE-HEAD-HACK-OF-THE-HIGH-COUNCIL-OF-HACKS with little or no result, sometimes just the thought of writing can be draining. And when writers drain of mental energy, so do we drain of words. I can’t stress this enough: When you need a break, take it. Remember: Not writing is a huge part of writing. I find meditation (which I prefer to call ‘sitting’ — sitting quietly with one’s self) before writing each day, sets the tone for my heart and mind. Shake the world off, let it go, even if just for a few minutes. Sit in a quiet space and just Be. I also get some of my best epiphanies during my morning sittings. A quiet mind breeds revelation. Hey, it’s worth a try, right? Or maybe find another hobby you love and indulge it when you’re feeling burnt out. How about gardening, running, painting, knitting sweaters for impoverished squirrels, whatever floats your boat! For me, I find reading a good book helps me out of a funk. Read an old favorite, a book that feels like crawling into a warm blanket. Read someone you admire, someone inspiring. Fill your creative well with another’s world and you may find, as I often do, that their words become like seeds that burrow inside your newly rested mind. Words that, when they bloom, spread the fine pollen of motivation necessary for growing new words of your own. Read, rest, repeat. Then, Writer, get back to work. ? Because life is bananas busy and has a way of taking what it needs if you let it, we writers must get a bit pushy and make room for motivation to enter and grow. Remember: big dreams can’t grow without s p a c e.
Due to my having a ridiculous number of offspring and another job, in order for me to flesh out my big dreams, I need to get up between 2:00 and 2:30 a.m. each morning to write. BUT, before you run away screaming, “NO WAY, UH-UH, HELL NO FOREVER!” hear me out! It doesn’t need to be that early, okay? Any uninterrupted time you can squeeze from the rock of life to devote solely to writing works. Make your time with your motivation sacrosanct. Even if it’s just ten minutes in a room alone, guard that ten minutes with your life. And, if it’s the same time each day, even better. Do this and your muse will know when to show up. It’ll learn that it can count on you to be there, same time, same place. The more you keep a steady routine, the more you’ll find, when you arrive, your muse and motivation are waiting for you, and likewise, so are your words. Every writer needs a support system. If you don’t have a network of writer-friends, please enter some contests, connect with writers on social media, wave your manuscript in the streets and scream-cry — anything to find your crew. I swear, the best decision I ever made was entering Pitch Wars, The Writer’s Voice, and other writing contests. Even if you don’t get in, making connections with other writers clamoring after the same seemingly impossible dream, is essential. I can’t tell you how many times I fell down the “I’m never writing again!” rabbit-hole of sorrow. But what I can tell you is how many hands reached down to grab me before I disappeared. Writers need writers, period. Fellow word-warriors are the most valiant, caring, and giving friends of all. 3. Creating a partnership with motivation that lasts. 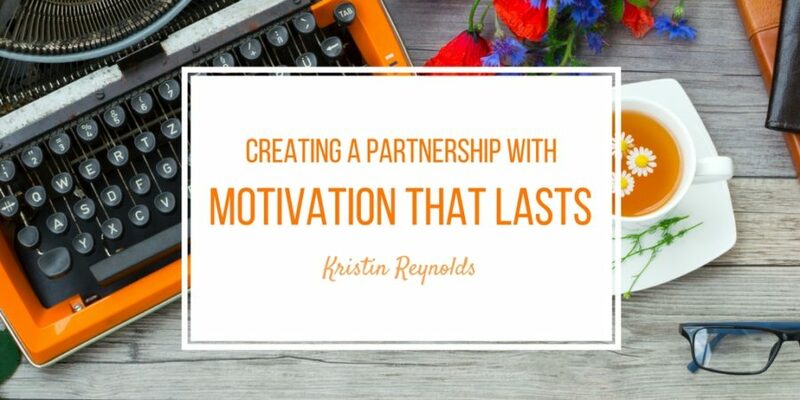 Writing books requires a partnership between author and motivation. And, as with any good partnership, whether it be marriage, friendship, or parent and child relations, along with the carefree walks in the park, so come the tantrums, drama, and work. Now, this may sound...straaaange…but bear with me. When you show up in the time you’ve carved from your busy life to devote toward your dream, ask yourself: what does my motivation need from me while I write? Does it like music? Silence? Scented candles burning in its honor? The blood of its enemy on a pike? What? Get a sense for its desires, what your motivation needs to thrive. Mine loves scented candles, Skyrim background music, and the blood of its enemies on pikes, but yours may prefer death metal and tiny cakes — who knows, we’re all different! Point is: discover what your motivation craves, and for the love of tiny cakes, GIVE IT WHAT IT WANTS! Learn to recognize when it’s been on the hamster-wheel too long and needs rest. Let your fragile motivation know it’s appreciated and loved. Do this, and chances are, not only will your motivation keep coming back, but it will love you. ‘… for the love of tiny cakes, GIVE IT WHAT IT WANTS!’ Haha – BRILLIANT! 🙂 Thank you, Kristin. A very useful and very timely blog. I loved everything about this post, particularly about bribing your motivation with cakes (possibly iced with the blood of your enemies). That’s always a win! Thanks Kristin. “There’s a reason your blood runs with words and your mind is a book constantly reading itself to you” is going on a sticky and affixing itself to my motivation board. And your book sounds amazing, can’t wait to read it!